Hannah Burke, Amber Burtch, Megan Stanitzek, Lauren Wilson, & Bridgett House students from Bellarmine University's Physical Therapy Program completing course requirements for PT 635 Differential Diagnosis of Complex Patient Problems. Previous Care or treatment: Patient had physical therapy 5 years ago following a right rotator cuff repair. Subjective : Pt reports insidious onset of right shoulder pain that began approximately 3 months ago. Pt reports pain is at worse 6/10, best 3/10. Pt describes the pain as a deep ache that wakes her up at night at least three times a week. Pt reports difficulty with self care activities such as bathing, hair care and dressing due to shoulder pain. Pt reports that she has lost weight unintentionally over the past month and attributes it to increased stress at work. Pt is a 58 year old female who presents to the clinic with complaints of right shoulder pain. Secondary to patients age, family history, and subjective report this patient was advised to return to their primary care provider for further medical screening. With this patient being a 58 year old female she is considered to be at risk for breast cancer. Another risk factor this pt possesses is a primary relative who has recently lost the battle to breast cancer. A significant concern with this pt is her complaints of night pain so severe it wakes her from sleep. This is a red flag that could indicate presence of tumor due to changes in hormone levels at nighttime that accompany neoplasms. The unexplained weight loss also gives reason to suspect a more systemic involvement rather than musculoskeletal origin. Pts reports of deep aching pain awakening her at night, decreased strength, and decreased ROM are inconsistent with musculoskeletal causes. Physical Therapist unable to reproduce pt's exact symptoms with examination. Pt followed-up with physical therapist with MD diagnosis of Stage 2 Breast Cancer. Due to pt’s family history of breast cancer, MD performed clinical breast examination followed by a mammogram. Tumor was found in R breast tissue but has not spread to lymph nodes or other surrounding organs. MD recommends continuing with surgical treatment to remove tumor through mastectomy. MD has written orders for post-op PT to manage wound care, swelling, and functional limitations. MD also requests multiple rounds of radiation (5 days a week for 5 weeks) (SGK) to ensure that abnormal cell growth has been ceased. Pt and caregiver were educated on possible side effects of radiation therapy including, skin irritation, redness, soreness, swelling, fatigue, Lymphedema4. After being discharged from Acute PT, pt was advised to go to outpatient physical therapy and received Lymphedema treatment along with functional training. Upon discharge from OP PT, pt was instructed to continue with physical activity through exercise groups or community programs. Support group information was administered to pt as well. After completing surgery and radiation therapy, most current mammogram reading showed no signs of abnormal cell growth in L breast tissue. Pt has since been participating in yoga, Pilates, weight training as well as doing a cycling class at her local gym. She has also been attending breast cancer support groups through the hospital to which she underwent treatment. Pt states that the exercise she feels has really helped in her recovery. She feels more in control of her life and condition. The exercises classes make her feel very empowered and feels very energized afterwards. Attending the support group makes her feel a sense of community and knows that she is not alone in this battle. Research has shown the benefits of physical activity in women who have been diagnosed with breast cancer who have participated in exercise programs before and after cancer treatment. A study by Bulmer et al. found that women who participated in an exercise group specifically for women with breast cancer reported feeling better both mentally and physically. The participants found it comforting to be a part of a group where all of the participants were going through the same thing. The participants reported an improvement in not only their physical health, but also their mental health. Qualitative reports from participants indicated a trend showing that exercise gives breast cancer patients an increased sense of control over their life during a time that can feel like there is very little they can control. Since physical therapists are the experts in movement, this is an area that PT can become more involved in the future. There is opportunity for PT to work on specific fitness goals with patients or direct them to community resources that are specific to fitness with cancer patients. 1. Bulmer SM, Howell J, Ackerman L, Fedric R. Women's Perceived Benefits During and After Breast Cancer Treatment. Women & Health. 2012; 52: 771-787. 2. Susan G. Komen for the Cure. Radiation Therapy and Side Effects. ww5.komen.org/BreastCancer/SideEffectsofRadiationTherapy.html. Accessed 26 March, 2015. 3. Goodmann CC, Snyder TEK. Differential Diagnosis for Physical Therapists: Screening for Referral. Edition 5. St. Louis, MO: Elsevier Saunders; 2013. 4. Questions about Radiation Therapy?. American Cancer Society website. www.cancer.org/treatment/treatmentsandsideeffects/treatmenttypes/radiation/radiationtherapy-whatitishowithelps/radiation-therapy-what-it-is-questions-about-rad-therapy. June 7, 2014. Accessed March 25, 2015. 6. Highlands Oncology Group. Support Services: Support Groups. 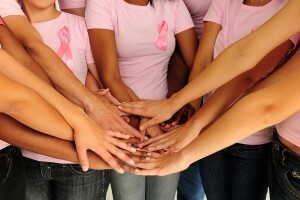 www.highlandsoncologygroup.com/support-services/support-groups. Accessed March 25, 2015. 7. St. Thomas More Hospital. 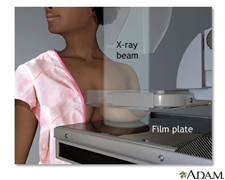 Digitial Mammography. www.stmhospital.org/stm/specialties/digital-mammography/. Accessed March 29, 2015. 8. Physical Therapy for Breast Cancer Patients Minimizes Side Effects | Beth Israel Deaconess Medical Center. http://www.bidmc.org/YourHealth/Health-Notes/BreastHealth/LatestNews/PhysicalTherapy.aspx Accessed 30 March 2015.